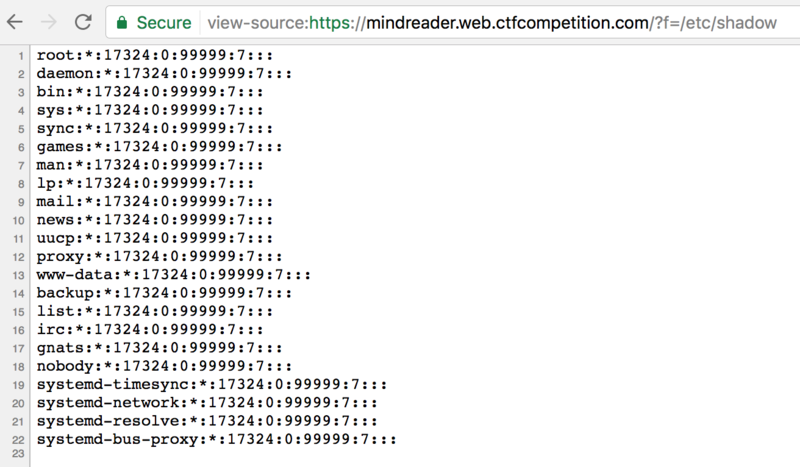 This is a write-up for the Google CTF 2017 “mindreader” challenge. Pretty much with the second term entered it was clear that any filename specified in the form will be read from the local disk. This sounded like an easy challenge. Better yet, since also /etc/shadow was displayed, this meant that the process is probably running with root privileges. Jackpot! The logical next step was to try to fetch the usual files you’d expect to contain anything useful: Service configuration files, shell histories, any log file or pretty much anything we could think of – but nothing useful was returned. Some files that we expected to exist like /etc/ssh/sshd_config threw a 404 and others (/proc/cpuinfo) a 403. The HTTPS server responded with a nginx server header but there was no sign of it anywhere either. Nor of any other webserver. With /etc/issue and /etc/debian_version the system was identified as a Debian 8.8. This explains the absence of pretty much any other service or configuration: We are attacking a Docker container. There is an environment variable called “FLAG” (line 6). Requests containing “proc” will always return a 403 (line 24). Coincidentally environment variables are of course stored in /proc. The filter looked solid and pythons open() does not accept wildcards. We cannot request anything containing “proc”. But if there is a symlink pointing to a folder inside of /proc we wouldn’t need to request a file with “proc” in its name, we could traverse from there. Quick research in a Vagrant VM showed that /dev/fd is a symlink to /proc/self/fd. And with that we finally got the flag. 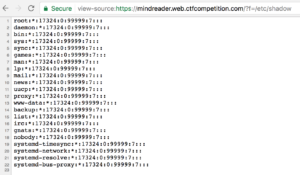 This entry was posted in CTF by Roman. Bookmark the permalink. 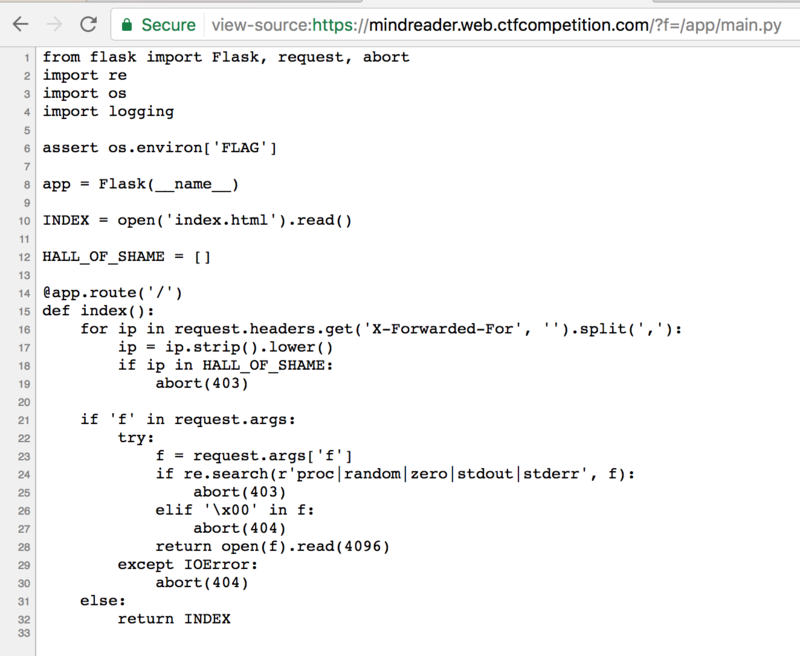 hxp CTF 2018 – time for h4x0rpsch0rr? 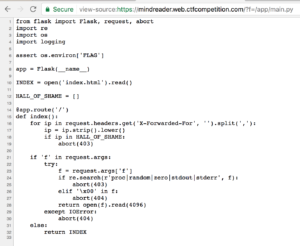 Hackover CTF 2018 – who knows john dows?